A stamp celebrating the Shaikh Zayed Heritage Festival was issued by the Emirates Post Group last month. The Emirates Post Group (EPG) recently issued a commemorative stamp to mark the Sheikh Zayed Heritage Festival, which is being held under the patronage of Sheikh Khalifa bin Zayed Al Nahyan, president of the United Arab Emirates (UAE), until Jan. 27. 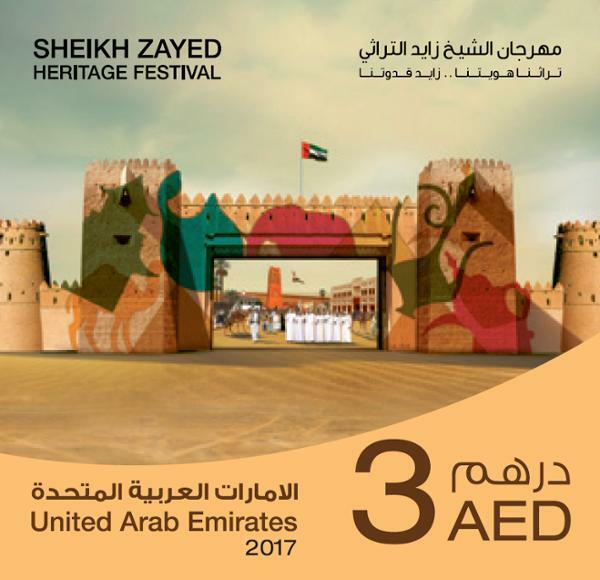 Giving the festival the “Zayed” name is recognition of the pivotal role of the late founding father Sheikh Zayed Bin Sultan Al Nahyan in preserving the history of the UAE. The festival celebrates the cultural heritage of UAE, highlights the rich diversity of local traditions and provides an educational platform to promote the process of cultural enlightenment. Abdullah Mohammed Al Ashram, acting CEO of EPG, said that the commemorative stamp serves as a documentation of as well as promotion for the festival. Al Ashram added the Zayed Festival, which is organized under the theme of “The Land of the Emirates, the Forum of Civilizations,” is one of the most important heritage events in the world to take place on the land of Zayed Al Khair.